I love salisbury steak. It’s so old school and reminds me of cheap, yet delicious, diner meals or tv dinners. Walking through the grocery store, I noticed some nice plump white mushrooms and decided to whip up a batch. Of course I wanted to give mine a low carb aspect, so added just a splash of cream and some arrowroot to thicken the sauce. 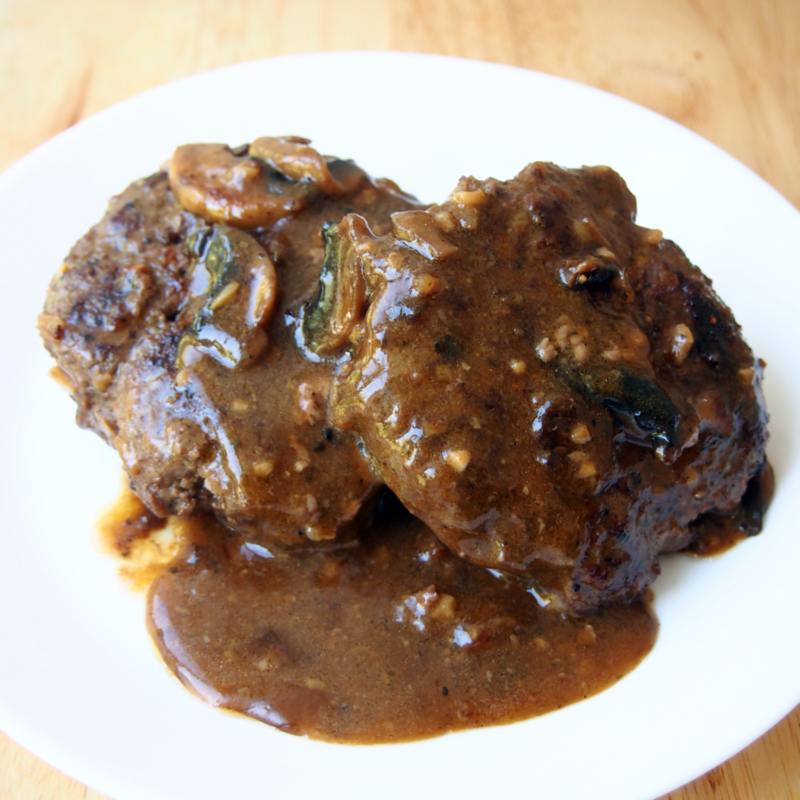 It still made a wonderful dark rich gravy and the mushrooms add a wonderful flavour punch. Note to not add salt until the end, let the stock do it its thing first and give it a final seasoning before serving. Combine the ingredients for the patties and form into four 1/2 inch thick patties. Set in the fridge to set, while preparing the other ingredients. Heat oil in a large frying pan, sprinkle the patties with the all purpose rub, and sear for minute or so on each side. Gently remove from the pan and set aside. Add the butter to the pan and let melt. Add the mushrooms, sprinkle with the all purpose rub, and saute until browned. Mix the stock, cream, and worcestershire sauce and add about 1/2 cup to the pan to deglaze it. Add the remaining stock, garlic, mustard, and Mrs. Dash and bring to a soft boil. Whisk in about 1 teaspoon of arrowroot powder and let soft boil for about 3 minutes. Keep adding 1/2 teaspoon at a time, letting simmer for 3 minutes each time, until the gravy ALMOST the desired thickness. Add the mushrooms and patties back in, cooking for about 3 more minutes, flip the patties over and let cook for another 4-5 minutes. Taste the gravy and season with salt and pepper if needed.